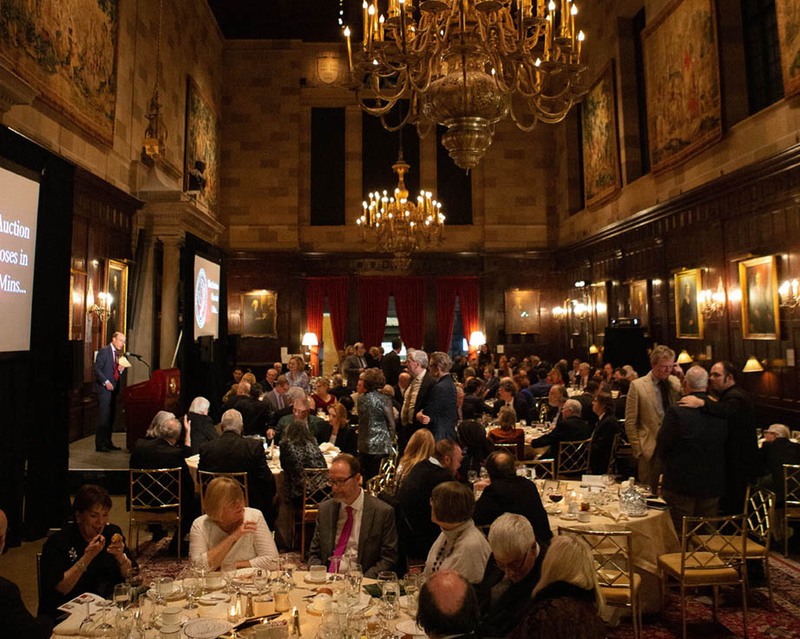 New York, NY - On Thursday, January 10, 2019, some 150 friends of the American Numismatic Society gathered to honor Mike Gasvoda with the Trustees’ Award at the Annual Gala Dinner, held at the Harvard Club in New York City. The Society was delighted to acknowledge Mr. Gasvoda’s exemplary devotion and commitment to the ANS. He has been a member and major supporter of the Society for over two decades, serving on the Board of Trustees from 2010 to 2016, and as first vice-present from 2013. A collector for decades, Mr. Gasvoda has over time built magnificent collections of Roman and Greek coins, medals, and US large cents. In the process, he has become well known in the numismatic community for his connoisseurship. He is equally renowned for his educational outreach. In addition to his work with the ANS, he has been active with the American Numismatic Association (ANA), the Chicago Coin Club, and the Tucson Coin Club, and he has lectured and exhibited parts of his collection at such venues as the Chicago International Coin Fair, the ANA’s World’s Fair of Money, and the ANA Summer Seminar. He has also written numerous articles for The Celator magazine and is a frequent contributor to The Numismatist. Recently Mr. Gasvoda purchased from Victor England and Eric J. McFadden the assets of Classical Numismatics Group, Inc. (CNG), a leading dealer in ancient, medieval, world, and British coinages. Mr. England and Mr. McFadden will remain as Senior Directors at the new company, renamed Classical Numismatic Group, LLC, with Mr. Gasvoda taking on a supervisory role as Managing Director. The ANS Annual Gala Dinner raised more than $200,000, including $15,000 raised through its live and silent auctions, the former called by Melissa Karstedt of Stack’s Bowers Galleries. The 25 lots included coins donated by Heritage Auctions, books from Lawrence Stack, a beautiful portrait rock by Tatyana Parker, as well as medals from the ANS, and other items donated by ANS members. Past recipients of the Trustees’ Award include such notable numismatists and donors as Ms. Shelby White and Mr. Leon Levy, Mr. Jamie Stewart, Mr. Kenneth L. Edlow, Mr. George Kolbe, Mr. Q. David Bowers, Mr. Chester L. Krause, Mr. Donald G. Partrick, Mr. Harvey Stack, Mr. Victor England, Jr., Mr. Ira Goldberg, Mr. Larry Goldberg, Mr. Harlan J. Berk, Mr. Roger S. Siboni, Mrs. Marian Scheuer Sofaer and the Honorable Abraham D. Sofaer, Mrs. Elizabeth Forbes Hazard Scott and Mr. Stanley DeForest Scott, and Mr. and Mrs. John W. Adams, Anthony J. Terranova, and the Eric P. Newman Numismatic Education Society and the Newman Numismatic Portal, and the Rosen Family. For information, please contact Emma Pratte at 212-571-4470, ext. 117, membership@numismatics.org.